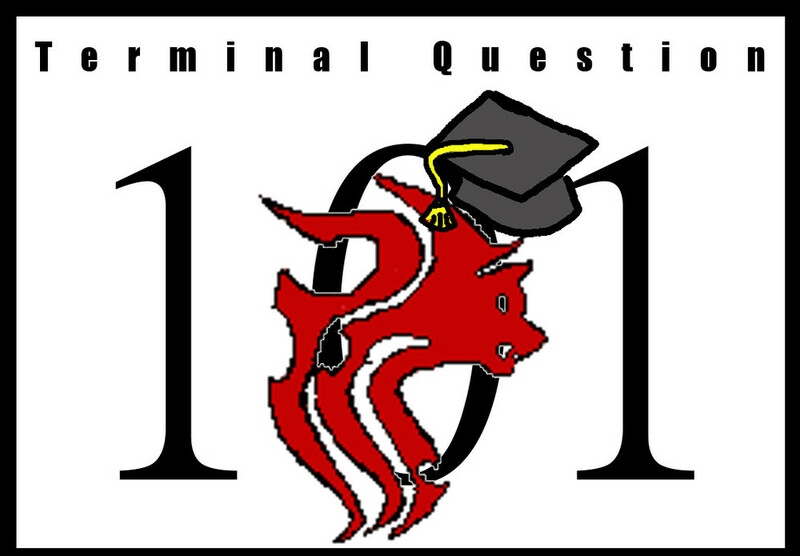 On tonight's episode of Terminal Questions 101 we talk about “He who knows what evil lurks in the hearts of men.” Tonight's episode starts now! Today's guest is Kale and she's here to talk to us about The Shadow. My knowledge to this point is pretty much limited to the movie, so this is going to be a nice learning experience for all of us – well, most of us at any rate I'd imagine. So, in case there's people out here that are listening to this that don't have any idea of who or what The Shadow is, why don't you give us a quick little topping of what it's all about? Alright, so The Shadow is pretty much a human character, uh, no real superpowers at least the version that I'm going to be referencing right now. Uhm, basically he has a, uh, arsenal of...uh, knowledge and experience in a number of techniques like spying – that sort of thing – and he has a uh, a network of agents that he uses in order to resolve a number of mysteries and do some work for him. Uh, this is an internationally network for him. So he usually runs around in complete black garb, uh, there are variations that include red scarves, red kerchiefs that sort of thing and he will carry anywhere from one to four, uh, forty-five automatic guns which for their time in the 1930's at least, those were very big. They were pretty much the brand new “this is as good as it gets” weapon of the time. Most police officers carried around a small uhm, Walther PPK kinda like what you see in James Bond, that kind of issue so it's a smaller weapon. Uh that was pretty normal. So The Shadow, uh, the era he takes place in is roughly the 1920's, the 1930's, even the 1940's, uhm, at least for the pulps. So there's a number of different variations of The Shadow: there's the pulp novels which were written in the 1930's so at that time they took place in present day. Uhm, for their time they were actually pretty progressive, all things considered. Uhm, they were most, the majority of them – two hundred and fifty novels – were written by one gentleman, uhm, the name on the books is usually Maxwell Grant but his name was Walter B. Gibson. Uh, he wrote that majority of them. There was a couple stand in writers, uh, Theodore Thomas Tinsley was one of them, uhm, I'll get back to him later, and then there were a number of other people who have since added material to the uhm... to the cannon I guess would be the best way to put it. Uh, so, we have the pulp fiction novels which – again - started in the late 1920's, uhm, around that time they also started up an announcer, uh, who was just a voice and he started going by the name Shadow and this was kind of their interim radio announcer who would announce the next new mystery series. People started asking about this character voice that they didn't know and so these stories started up and that's where you get a lot of the uhm, the years of radio plays for The Shadow. A number of people played The Shadow, uh, some of the more famous ones would be Orson Welles, uhm, Bob Johnstone. They were kind of the more – if you know the uh, the history of the Shadow radio plays you would probably recognize those names. There were about three or four others I believe that also played The Shadow, but I don't know them off the top of my head. Uhm, there were actually a couple of, uh, movies made in the forties along with a small silver screen serial that were themed to The Shadow, a couple of them you can actually find on some uh,internet group sites such as Netflix. I, depends on whether or not, uh, your into them - these movies are definitely older so they so their age sometimes, and then also there's the uhm, 1994 Alec Bal-, Alec Baldwin movie. Uh, that one is the one you were talking about earlier. So that was more well known and I'll go into that one shortly and then there's the rather large collection of comic books that have been running since the sixties I believe. Ever since the golden age of comic books The Shadow's been around. He was in the news papers with those different small strips and up to present day where he has a number of series currently out. Yeah, so we're approaching on a hundred years soon cause it started in the late 1920's. Definitely a long enough span to build up a... large cast of characters I'd imagine. Make them more popular and upbeat. Yeah. So uhm, Margo has historically has not been a favorite of the authors but she is in pretty much every single comic that I've ever read. She appears somewhere within the actual story, unless it's one of the crossovers and even then she appears a lot. Uhm, she's kind of hit or miss. She's always tagging along after The Shadow, and some ways she's written shes uh... she's definitely capable, and then others your just like “a stick would do a better job.” [chuckles]. [chuckles] Now, is that something that it's more of somebody – like specific authors would end up making her a more capable person as opposed to other ones, or is that something where it's kinda inconsistent even between the same writers? Its just... different writers portray her as different personalities, but each writer maintains that single personality they choose for her. Uhm, she does mature through the pulps into someone that kind of one of those Shadow goes “who are you, what are you doing here, and why are you following me around,” and eventually she does mature into a capable enough agent for him when he's trying to accomplish his missions that he may not otherwise be able to accomplish as easily. Now, Margo Lane is the one from the Alec Baldwin movie correct? Uhm, Penelope Ann Miller played Margo Lane. Alright. It's been a while since I watched so I just wanted to make sure. In that movie she's blonde again, and apparently psychic. Uhm, that's another interesting thing. The psychic power in itself is questionable in the pulps. It's kind of hinted at... uhm, Gibson had an interest in the occult and magic, he was very good friends with Harry Houdini actually. Uhm, he had a pair of – the story goes he had a trick that even Houdini couldn't figure out and it was a small – uhm – parlor trick basically so he could do it with just - uh - a couple of things he would have in his pocket and he could use it in his hands, so even Houdini couldn't figure that one out. He had an interest in the occult, uhm... particularly debunking a lot of things. Uhm... but he also – it added a level of credibility to the stories, because when he wrote these incredible escapes for The Shadow they were all based in physical reality. In fact one of his escapes, uhm... not a lot of people know the name Blackstone but he was the main – uhm – competition to Harry Houdini at the time and he was also friends with Walter Gibson and Walter said “hey” - Gibson said “Hey, I came up with this really great escape idea in this story, why don't you use it in your magic show?” It ended up becoming the main event for this gentleman's – uhm - world traveling magic show. And he told him how to accomplish it and make it look good, so he was a very brilliant gentleman who could really come up with some great illusions which makes – in my opinion – his stories that much more believable in the fact that The Shadow makes some really incredible escapes but he explains how it was accomplished and how it was physically possible. Now, the psychic powers... as-as far as the movie goes they kinda had that a little on the heavy side, but you're saying it was more of a allude to thing and not really this drawn out hes going around lifting things with his mind and stuff like that like happened in the movie. Oh yeah, nothing like that. Uhm, he would use hypnotism, which he would use it on a level that's more stage magic, but that was about the extent of all of the quote - uhm - psychic power that he had in the pulps, whereas with a lot of the uhm... later variations in the comics and in the radio show – that's where the actual psychic ability comes in. Uhm... in the radio show they use the power to cloud men's minds was literally a psychic ability to hypnotize people and that was the entire brunt of his ability in the radio shows, and that's really where that entire thing comes from. So it was nothing the actual author originally came up with, it was the uh... writers for the radio show. I know they did work with him a bit but uhm... to the extent I'm not certain and it sounds like he was like “oh yeah okay, it's entertaining” but it wasn't really what he saw in his mind as the character's build but that, that psychic power has really come into play very heavily in the uhm... in the later comic book uh... variations, in the later movies that have come up, that sort of thing. Trying to make him a little more fantastical for modern audiences I would assume. Yeah. Uhm... its, in my opinion kind of like giving Batman the ability to blend into shadows. And that's another story too! The - uhm - very very first batman comic that was ever drawn was a word for word duplication of a Shadow story. Yep. Uhm... it - I can't remember the name uhm... the story for the life of me, but it was ironically one of the ones that was written by Tinsley, not Gibson. Tinsley only wrote like twelve or fifteen stories whereas Gibson wrote over 200 but the story was a little more gritty, a little more interesting, but the very first Batman comic ever written had this - basically they replaced The Shadow with Batman. Literally. Batman had guns, Batman had an auto gyro, uhm... he... did the exact same things that The Shadow did, it like literally – every single word is the same. Uh... the Joker was inspired by two different variations of novels from The Shadow including this one specific book uh – Partners in Peril! That's the name of it! Partners in Peril. I highly recommend - uhm - taking a look at that if you get a chance to look at this uh... Shadow Sanctum books. Uhm... one of the comic book artists whose a friend of the family have been reprinting the original novels and he does a lot of - uhm - excerpts in the actual novel because there's two stories per book. That is quite the feat. Course, nowadays Batman's taken quite a change for himself as well. So it's nice to see that he's got his own wings instead of just riding on The Shadow the entire time.
. Now... there's a big cast of characters... so I imagine there's going to be all manner of villains as well. Uh... how about a couple of the main ones? Basically groups of people uhm... that, they might be able to continue their crimes by passing them on to others, but other than that there's really no one main villain. Uhm... Shiwan Khan tends to be the one that everyone leans on – to this day I don't know why. Uh – he's a good villain, there's not doubt about that. He has some really great stories, in fact he has three pulp novels himself. Uhm... they're all really interesting reads but there are a number of other villains uh... my personal favorite is Doctor Mocquino and he uh, personally in my opinion gives a very good fight to The Shadow. Not just mentally but also physically he provides a really big threat to him and his agents. There's some really great uhm, imagery in those books that just... really keeps you on the edge of your seat. Uhm... he – there's a story called The Shadow over Alcatraz and it's an interesting story that takes place while the Golden Gate Bridge is still being built and it- he's uhm... basically trying to raid Alcatraz because there's a crime boss there that's taken over the uhm... island. It's very interesting. Uhm... the Salamanders is another personal favorite of mine. Uhm... they're a bunch of – a group of pyros that are uh... doing crime throughout the city – I'm not going to try to spoil it for anyone. Very good read, another one that really poses a threat to The Shadow. Uhm... let's see, what else do we have, we have the Jeho Fan. Uh... just tons of different crime groups. You get a lot of small time crime it seems like, or criminals that are going after these really – uhm – wealthy people or even just generic people on the street that are being taken advantage off and The Shadow will fight for anyone regardless of your social status and I think that's part of what drew him in to a lot of people. So he's in essence kinda more of a everyday hero fighting everyday villains as opposed to something like Batman where pretty much the only time you ever really see him engaged in any kind of fighting is with one super villain or another. So there's no real set “this is the list of villains,” he comes out and does - basically if there's a crime and he considers it worth his time which pretty much everything he does, he'll go for it. Alright, that's at the very least gotta keep it open for stories. Without having ta- without having to way yourself down with using a specific set of villains every time. Yeah, it keeps things very open but also uh, it makes it a little difficult because you can't say “Hey, uhm... I'm gonna say Mr Freeze survives and I'm gonna bring him back.” It was okay when you get one and you kill one villain, their really really dead unless they're one of the big guys that comes back two or three times. But on the bright side, you also have all manner of people you can come up with to replace them as well. Exactly. It's not limited to okay we have to always have someone trying to take over the world, it's “okay, this week we're going to have a story where these guys are trying to take advantage of some artists, or these people are trying to smuggle jewelry in, or these guys are planning the perfect set of murders they-it-the list is endless. Now, one other thing that I kind of remember from the movie – again, it's been a while so I mean, my memory's a little foggy on it – I mean I remember the telepathic bits and the Margo Lane and the invisible buildings... did his network have the rings like they do in the movie, or is there some other way he actually distinguished all the people of his network? The movie is actually the only time that ever happens, where all his agents are wearing rings. In the ninety years that the character's been around, that’s the only time. Uhm... basically The Shadow knows who his agents are, he doesn't use those little trinkets to identify them and they don't know who each other are until he puts them on the same side together. So there are quite a few adventures where you'll have a series of agents that work together, uhm... the most common three tend to be Harry Vincent, Cliff Marsland, and Hawkeye, and they're a trio that have very different skills but uhm... occasionally they'll work together. Usually their ind of like a hit crew in regards to when The Shadow needs a little extra firepower and knows that he's gonna need someone to back him up he brings those three in, or he brings one or two of them in depending on what he needs. Uhm... he has a number of other agents that he can pull in as well, and they'll do anything for him. Uh, the other difference is Burbank, which nobody ever hears his name really, uhm... but he's the guy in the movie where all the tubes come down into the organ looking thing. Uh, he's the contact man, and he's the one whose most rarely seen by the other agents, but there are occasions in certain stories where he does leave his contact room in order to do missions for The Shadow, so he too does actually get physically involved with a number of different events that are going on depending on whats happening. Alright. That's... that's good. Provides a nice, wide array of characters, each that could have their own personalities and things. Uh... I-I assume that for the most part sometimes they play probably as much a role as The Shadow does in things. But, basically makes up Vincent to look like him and so the two of them go walking around in this party, and while The Shadow is doing his thing Vincent is basically pretending to be The Shadow's identity. So his agents come in very useful. There's another opportunity where uhm... The Shadow actually calls up somewhere around six or seven of his agents uh... off the top of my mind I can't remember all of them but they were some of the big hitters, and he basically dressed them all up as his garb, so they had the black hat and the black cloak and the automatics – the forty-five automatics – they used it to confuse the snot out of the enemy and they basically just kind of all hoarded upon these bad guys. So you have like seven or eight guys dressed exactly as The Shadow, you can't tell any of them apart, and they're all just coming down on this crime ring, taking 'em out. It's pretty cool. Quite the tactician he sounds to be. Very much so, that would be an understatement I think. Uhm... he's historically in the pulps, he's a master spy, uh... formally of the first world war and that's really kind of the major history we get for him. There's no real “oh he went to Asia and he did all this,” but there are mentions that he did go to areas like Tibet and such to study and learn various tactics of discipline that would help him, but aside from that there's really not a whole lot gone into whereas with the movies we get this whole “he was a bad guy, he was a crime lord, he was a drug lord, he was absolutely uhm... evil, there was not a good bone in his body and then he was saved.” Uhm... a lot of the comics have kinda done the pick and choose situation, most of them tend to go with what the movie ended up going with. Ironically, the back story for the movie was written back in the 80s during a comic - uhm - that was being run at the time. So even the movie doesn't pull from anything other than this comic that just pulled this idea out of the air as far as I'm aware and said “Hey, this is The Shadow's new back story, we'll make him dark,” and that's where they went with it and that historically has started to really follow the character very heavily. I can kinda see why, because I'd imagine a lot of the people like- especially around the time the movie actually came out – were probably more familiar with it from that than they would be from other things necessarily. Kind of similar to how a lot of people are more familiar with the X-Men from the modern movies than they are from the good ole cartoon days and all of that. Which is kind of a shame on both accounts more than likely. I'll second that. Uhm... Yeah, basically it's a lot of... the 80s have heavily influenced the more recent variations of The Shadow. Uhm... including the significance of the ring. The Girosal ring, which is a fire opal, uhm... that has an interesting back story that kind of comes and goes. It's brought up two or three times in the pulps, it's brought up incessantly in the comic books, and to this day even the current comics seem to be a little heavy on the mystery of the Girosal which is eh – it's writers choice. Well it's probably a good call for a man of mystery to have something exceptionally mysterious. Although... I imagine it's probably not as heavily mystically oriented as it is in the movie, as most of the things in the movie so far seem to be... pretty over the top compared to their written sources. The uhm... I think the best way to compare the 1994 Shadow movie is to look at the – uhm – early 90s Batman movies. That's basically the kind of comparison that your making to the source material. A bit over the top, a little Hollywood-ed up. Trying to get your attention and have you come back for more. Lets make it as neon and dark as we possibly can. I mean, they're still remaking movies like that. I've read the synopsis of it and it's potentially interesting. Uh... they basically give Margo Lane Harry Vincent's back story, as far as I'm aware. I don't know if that's an official uhm... and official source because it's been hit or miss – I mean at one point I heard something about Quentin Tarantino doing the movie. That – That would be an interesting take on it no doubt. Yeah, uhm... actually on that topic Sam Raimi is a huge Shadow fan and he tried to do a Shadow movie – he wrote a script for it – and he wanted to film it, but the problem is he couldn't get the rights to The Shadow, so what he did is changed his script and that's how he got Darkman. That would explain some of the similarities and ideas. Yeah, uh... he basically redubbed- reduxed the script and updated it and brought it into the current day and threw Liam Neeson in it and got Darkman. Was a pretty entertaining movie. It was. It's a shame I would have liked to see what he would have done if he had been able to get the Shadow rights – the rights to The Shadow. Probably marvelous things, no doubt. I mean, if the first Spiderman movie was any, was any uh... indication of what he might have been able to do, uhm... I think he could have been able to do a potentially good job but who knows! Mhm. The world may always wonder, but I am sure there is one who would know, because The Shadow knows. Now, we're at about time here so I'm gonna start wrapping this up. I would like to remind any listeners or if your reading the transcription instead because you don't want to listen to our wonderful voices that if you are interested in this I would implore you to like the post, or like it on Facebook or wherever you happen to be finding it so that I can find out that you indeed enjoy this topic and want to hear more about it. If you have any questions for our wonderful guest today, feel free to leave those as a comment and if it so happens that we do, at some point, come back and there's a gaggle of questions laying about we can do another episode here and you guys can learn even more about The Shadow – a more human superhero if you will than a lot of the heroes we have of today. I would like to thank you for coming on the show and sharing all this with me. Well thank you for inviting me. And until next time folks, keep thinking up them questions.